Well, you're the coolest mom ever. My mom would have flipped had she found any of us on the roof. Even if we WERE just reading up there. SHe's brilliant. One for her wonderful curiosity and for knowing exactly where the best place is for reading. I love it! It looks like a great reading spot. I"ll have to try that one day. Too funny! Thanks for pointing me here. 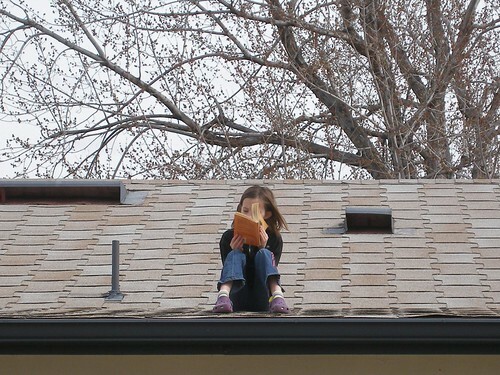 Definitely a homeschool spring thing, it seems, this reading on the roof! Oh that is so great. And, about homeschooling. I am interested...do you do it with all of your kids? Perhaps you've talked about it on your blog and can direct me to a post...or,maybe I am creating an idea for you to write about (not that you have any shortage of ideas!). I only homeschool Joey, our youngest. Our other 3 kids are actually my stepkids (and my stepson is already 19). And our older girls love their public high school, but I’ve told them that the offer always stands for homeschooling if they change their minds. 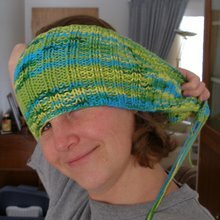 My first thoughts on why I chose homeschooling are here http://wisdomofthemoon.blogspot.com/2007/11/road-less-traveled.html Really, we’ve only done it for about a year and a half, so we’re still trying to find our stride. For me, the hardest part has been undoing what public school did… math phobia, waiting to be told what to do, but it’s generally pretty wonderful. I wish I had planned to homeschool from day one, because when they’re little, teaching them is so natural. All of life is interesting and worth exploring, and homeschool just develops out of that. It doesn’t have to be sitting at a desk, waiting for information to be poured into your brain. And I’m sure Bug would love to be homeschooled.